Hemangiomas occur most often in skin or subcutaneous tissue, and dermatologists, pediatricians, and primary care medical physicians typically treat these readily identifiable processes. One common example is the senile or cherry hemangioma, which is a benign, self-limited, small, red-purple skin papule seen in elderly patients. Another is the strawberry nevus, which is seen in approximately 0.5% of infants and spontaneously involutes in the vast majority of cases. Visceral hemangiomas are far less common but may have greater consequences when they result in organ dysfunction. Rarely, hemangiomas may be associated with other pathologic processes, such as the consumptive coagulopathy of Kasabach-Merritt syndrome and tumor-induced osteomalacia. Gorham disease is a process of massive osteolysis, which is believed to be within the spectrum of hemangiomatous disease. Hemangiomas occurring in the setting of multiple enchondromatosis are part of the spectrum of Maffucci syndrome. For patient education resources, see the Skin Conditions and Beauty Center, as well as Bruises. Hemangiomas are benign lesions with increased numbers of blood vessels. They can affect numerous tissue types (individually or in combination), including skin, subcutaneous tissue, viscera, muscle, synovium, and bone, but they do not spread to avascular tissue such as cartilage. Although the etiology is not entirely clear, development of Kasabach-Merritt syndrome seems to be related to stagnation of blood flow within a large hemangioma, which leads to platelet trapping and a subsequent consumptive coagulopathy. The mechanisms behind osteomalacia have not been fully elucidated. Most deep soft tissue hemangiomas probably are asymptomatic and small and go completely unnoticed; therefore, the exact incidence and prevalence are impossible to determine with any degree of certainty. That said, intramuscular hemangiomas are uncommon compared with other types of hemangiomas. Muscle hemangiomas accounted for 10 of 570 hemangiomas reported by Geschickter and Keasbey. Watson and McCarthy estimated that intramuscular hemangiomas accounted for 0.8% of all benign vascular tumors. Intramuscular hemangiomas occur most often in young people (range, 2 months to 66 years), with 80-90% presenting in persons younger than 30 years. Males and females are affected with nearly equal frequency. Hemangiomas of bone accounted for approximately 1% of primary bone tumors from which biopsies were taken in Dahlin and Mirra's series. Hemangiomas of bone may occur in patients of any age. Approximately 25% present in persons in the fifth decade of life; however, hemangiomas have been reported in patients as young as 2 years and as old as 77 years. Hemangiomatosis and skeletal-extraskeletal angiomatosis are rare conditions. Gorham disease (ie, massive osteolysis, disappearing bone disease) is very rare (see the image below). The disease typically occurs in the second or third decade of life with most patients younger than 40 years. Radiograph of a patient with Gorham disease showing dissolution of bone. Kasabach-Merritt syndrome is a rare complication of large hemangiomas in which platelets are trapped and a consumptive coagulopathy ensues. Outcomes for diffuse synovial hemangiomas are similar to those for intramuscular hemangiomas. Patients with localized synovial hemangiomas tend to have excellent results following surgical excision. Many osseous hemangiomas remain asymptomatic, require no treatment, and have no significant sequelae. In a small series, patients with symptomatic or locally aggressive vertebral hemangiomas treated with interventional or surgical modalities had good results, with either complete resolution of symptoms or only mild symptoms reported by the patients. All patients returned to their prior levels of activity and reported minimal or no residual pain in daily activities. Hemangiomatosis often becomes symptomatic during childhood, yet is nearly impossible to excise. Therefore, treatment with chemotherapy has been tried with variable success. The rarity of Gorham disease precludes a clear assessment of its prognosis. Results of treatments have varied. Mulliken JB. Cutaneous vascular anomalies. McCarthy JG, May JW Jr, Littler JW, eds. Plastic Surgery: Tumors of the Head and Neck and Skin. Philadelphia: WB Saunders; 1990. 3191-223. Godanich IF, Campanacci M. Vascular hamartomata and infantile angioectatic osteohyperplasia of the extremities. J Bone Joint Surg. 1962. 44A:815. Metry D. Update on hemangiomas of infancy. Curr Opin Pediatr. 2004 Aug. 16 (4):373-7. [Medline]. Smolinski KN, Yan AC. Hemangiomas of infancy: clinical and biological characteristics. Clin Pediatr (Phila). 2005 Nov-Dec. 44(9):747-66. [Medline]. Canavese F, Soo BC, Chia SK, Krajbich JI. Surgical outcome in patients treated for hemangioma during infancy, childhood, and adolescence: a retrospective review of 44 consecutive patients. J Pediatr Orthop. 2008 Apr-May. 28(3):381-6. [Medline]. Holzapfel BM, Geitner U, Diebold J, Glaser C, Jansson V, Dürr HR. Synovial hemangioma of the knee joint with cystic invasion of the femur: a case report and review of the literature. Arch Orthop Trauma Surg. 2009 Feb. 129 (2):143-8. [Medline]. Melman L, Johnson FE. Intramuscular cavernous hemangioma. Am J Surg. 2008 Jun. 195(6):816-7. [Medline]. Muramatsu K, Ihara K, Tani Y, Chagawa K, Taguchi T. Intramuscular hemangioma of the upper extremity in infants and children. J Pediatr Orthop. 2008 Apr-May. 28(3):387-90. [Medline]. Yu L, Cai L, Yu G, Zeng Z, Tao S. Solitary giant hemangioma of the humerus. Orthopedics. 2009 Dec. 32(12):925-8. [Medline]. Devaney K, Vinh TN, Sweet DE. 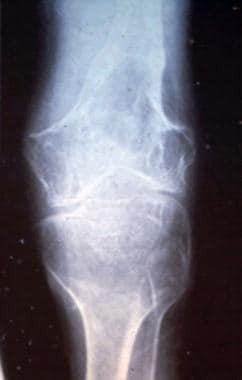 Skeletal-extraskeletal angiomatosis. A clinicopathological study of fourteen patients and nosologic considerations. J Bone Joint Surg Am. 1994 Jun. 76(6):878-91. [Medline]. Kuriyama DK, McElligott SC, Glaser DW, Thompson KS. Treatment of Gorham-Stout disease with zoledronic acid and interferon-a: a case report and literature review. J Pediatr Hematol Oncol. 2010 Nov. 32(8):579-84. [Medline]. Errani C, Zhang L, Panicek DM, Healey JH, Antonescu CR. Epithelioid hemangioma of bone and soft tissue: a reappraisal of a controversial entity. Clin Orthop Relat Res. 2012 May. 470(5):1498-506. [Medline]. Errani C, Zhang L, Sung YS, Hajdu M, Singer S, Maki RG, et al. A novel WWTR1-CAMTA1 gene fusion is a consistent abnormality in epithelioid hemangioendothelioma of different anatomic sites. Genes Chromosomes Cancer. 2011 Aug. 50 (8):644-53. [Medline]. [Full Text]. Kleck CJ, Seidel MJ. Epithelioid hemangioma of the distal humerus with pathologic fracture. Orthopedics. 2012 Jan 16. 35(1):e116-9. [Medline]. Chang J, Most D, Bresnick S, Mehrara B, Steinbrech DS, Reinisch J, et al. Proliferative hemangiomas: analysis of cytokine gene expression and angiogenesis. Plast Reconstr Surg. 1999 Jan. 103 (1):1-9; discussion 10. [Medline]. Radhakrishnan K, Rockson SG. Gorham's disease: an osseous disease of lymphangiogenesis?. Ann N Y Acad Sci. 2008. 1131:203-5. [Medline]. Geschickter CF, Keasbey LE. Tumors of blood vessels. Am J Cancer. 1935. 23:568, 591. Watson WL, McCarthy WD. Blood and lymph vessel tumors. A report of 1056 cases. Surg Gynecol Obstet. 1940. 71:569-88. Watanabe S, Takahashi T, Fujibuchi T, Komori H, Kamada K, Nose M, et al. Synovial hemangioma of the knee joint in a 3-year-old girl. J Pediatr Orthop B. 2010 Nov. 19 (6):515-20. [Medline]. Mirra JM. Vascular tumors. Mirra JM, ed. Bone Tumors: Clinical, Radiologic, and Pathologic Correlations. Philadelphia: Lea & Febiger; 1989. Vol 2: 1336-77. Pretell-Mazzini J, Chikwava KR, Dormans JP. Low back pain in a child associated with acute onset cauda equina syndrome: a rare presentation of an aggressive vertebral hemangioma: a case report. J Pediatr Orthop. 2012 Apr-May. 32(3):271-6. [Medline]. Beham A, Fletcher CD. Intramuscular angioma: a clinicopathological analysis of 74 cases. Histopathology. 1991 Jan. 18(1):53-9. [Medline]. Blecher R, Smorgick Y, Anekstein Y, Peer A, Mirovsky Y. Management of symptomatic vertebral hemangioma: follow-up of 6 patients. J Spinal Disord Tech. 2011 May. 24(3):196-201. [Medline]. Oumakhir S, Ghfir M, El Ktaibi A, Albouzidi A, Sedrati O. Synovial hemangioma of the ankle. Foot (Edinb). 2010 Mar. 20(1):42-3. [Medline]. Price NJ, Cundy PJ. Synovial hemangioma of the knee. J Pediatr Orthop. 1997 Jan-Feb. 17(1):74-7. [Medline]. Alexander J, Meir A, Vrodos N, Yau YH. Vertebral hemangioma: an important differential in the evaluation of locally aggressive spinal lesions. Spine (Phila Pa 1976). 2010 Aug 15. 35(18):E917-20. [Medline]. Heyd R, Seegenschmiedt MH, Rades D, Winkler C, Eich HT, Bruns F, et al. Radiotherapy for symptomatic vertebral hemangiomas: results of a multicenter study and literature review. Int J Radiat Oncol Biol Phys. 2010 May 1. 77(1):217-25. [Medline]. Griffin N, Khan N, Thomas JM, Fisher C, Moskovic EC. The radiological manifestations of intramuscular haemangiomas in adults: magnetic resonance imaging, computed tomography and ultrasound appearances. Skeletal Radiol. 2007 Nov. 36(11):1051-9. [Medline]. Vilanova JC, Barceló J, Smirniotopoulos JG, Pérez-Andrés R, Villalón M, Miró J, et al. Hemangioma from head to toe: MR imaging with pathologic correlation. Radiographics. 2004 Mar-Apr. 24(2):367-85. [Medline]. Imagama S, Ito Z, Wakao N, Sakai Y, Kato F, Yukawa Y, et al. Differentiation of localization of spinal hemangioblastomas based on imaging and pathological findings. Eur Spine J. 2011 Aug. 20(8):1377-84. [Medline]. [Full Text]. Tang L, Yang B, Yin B, Wang L, Zhang B, Ding Q. [Diagnosis and surgery for intramuscular hemangioma of skeletal muscle]. Zhongguo Gu Shang. 2014 Dec. 27 (12):1033-5. [Medline]. Greenspan A, Azouz EM, Matthews J 2nd, Decarie JC. Synovial hemangioma: imaging features in eight histologically proven cases, review of the literature, and differential diagnosis. Skeletal Radiol. 1995 Nov. 24(8):583-90. [Medline]. Zbojniewicz AM, Hartel J, Nguyen T, Wilks K, Mace A, Hogg JP. Neoplastic disease of the vertebral column: radiologic-pathologic correlation. Curr Probl Diagn Radiol. 2010 Mar-Apr. 39(2):74-90. [Medline]. Cross JJ, Antoun NM, Laing RJ, Xuereb J. Imaging of compressive vertebral haemangiomas. Eur Radiol. 2000. 10(6):997-1002. [Medline]. O'Connell JX, Kattapuram SV, Mankin HJ. Epithelioid hemangioma of bone. A tumor often mistaken for low-grade angiosarcoma or malignant hemangioendothelioma. Am J Surg Pathol. 1993 Jun. 17(6):610-7. [Medline]. Sung KS, Seo SW, Shon MS. The diagnostic value of needle biopsy for musculoskeletal lesions. Int Orthop. 2009 Dec. 33(6):1701-6. [Medline]. Enzinger FM, Weiss SW. Soft Tissue Tumors. St Louis: Mosby-Year Book; 1995. 579-626. Cohen AJ, Youkey JR, Clagett GP, Huggins M, Nadalo L, d'Avis JC. Intramuscular hemangioma. JAMA. 1983 May 20. 249 (19):2680-2. [Medline]. Bremnes RM, Hauge HN, Sagsveen R. Radiotherapy in the treatment of symptomatic vertebral hemangiomas: technical case report. Neurosurgery. 1996 Nov. 39(5):1054-8. [Medline]. Parekh AD, Amdur RJ, Mendenhall WM, Morris CG, Zlotecki RA. Long-term Tumor Control with Radiotherapy for Symptomatic Hemangioma of a Vertebral Body. Spine (Phila Pa 1976). 2019 Jan 7. [Medline]. Henley JD, Danielson CF, Rothenberger SS, Hsueh Y, Thelia A, McCarthy LJ. Kasabach-Merritt syndrome with profound platelet support. Am J Clin Pathol. 1993 May. 99 (5):628-30. [Medline]. Tan X, Zhang J, Zhou S, Liu Z, Zhang T, Xia J. Successful management of steroid-resistant vascular tumors associated with the Kasabach-Merritt phenomenon using sirolimus. J Dermatol. 2018 May. 45 (5):580-583. [Medline]. de Prost Y, Teillac D, Bodemer C, Enjolras O, Nihoul-Fekete C, de Prost D. Successful treatment of Kasabach-Merritt syndrome with pentoxifylline. J Am Acad Dermatol. 1991 Nov. 25 (5 Pt 1):854-5. [Medline]. Wang P, Zhou W, Tao L, Zhao N, Chen XW. Clinical analysis of Kasabach-Merritt syndrome in 17 neonates. BMC Pediatr. 2014 Jun 11. 14:146. [Medline]. [Full Text]. Wang CS, Wu PK, Chiou HJ, Chen CF, Chen WM, Liu CL, et al. Nonpalpable intramuscular hemangioma treated with hookwire localization and excision. J Chin Med Assoc. 2014 Aug. 77(8):426-9. [Medline]. Robinson Y, Sheta R, Salci K, Willander J. Blood Loss in Surgery for Aggressive Vertebral Haemangioma with and without Embolisation. Asian Spine J. 2015 Jun. 9 (3):483-91. [Medline]. Goldstein CL, Varga PP, Gokaslan ZL, Boriani S, Luzzati A, Rhines L, et al. Spinal hemangiomas: results of surgical management for local recurrence and mortality in a multicenter study. Spine (Phila Pa 1976). 2015 May 1. 40 (9):656-64. [Medline]. Cortical thickening of the tibia adjacent to an intramuscular hemangioma of the leg. Radiograph showing phleboliths in an intramuscular hemangioma of the thigh. T1 and T2 MRI images of intramuscular hemangioma of the leg. Note the serpentine quality of the vessels and that the hemangioma is high signal on both T1 and T2. This indicates that the hemangioma is predominantly of water density. MRI (sagittal cut) illustrating the jailhouse appearance of a vertebral hemangioma. Axial cut on CT scan illustrating the polka dot appearance of an intraosseous vertebral hemangioma. T1 (time to repetition [TR]=500, time to echo [TE]=15.0/1) and T2 (TR=3000, TE=15/Ef) images of an intramuscular hemangioma of the leg. This hemangioma is dark on T1 and bright on T2 indicating that this hemangioma likely has fat or other nonliquid products within it. Radiograph of a vertebral hemangioma illustrating the corduroy or jailhouse appearance of striations. Low-power view of the histology of an intramuscular hemangioma. Note the vascular channels. High-power view of the histology of an intramuscular hemangioma. Red blood cells are visible within the vascular channels. Disclosure: Received honoraria from Synthes for speaking and teaching.